Hi there, friends! I hope all of you are staying cool this summer. 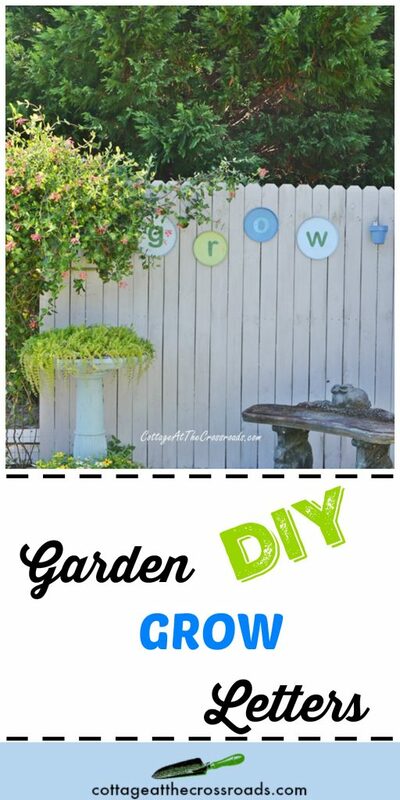 Today I’m joining the Thrifty Style Team and sharing my DIY Garden GROW Letters that I made a few years ago. Yep! That’s right! 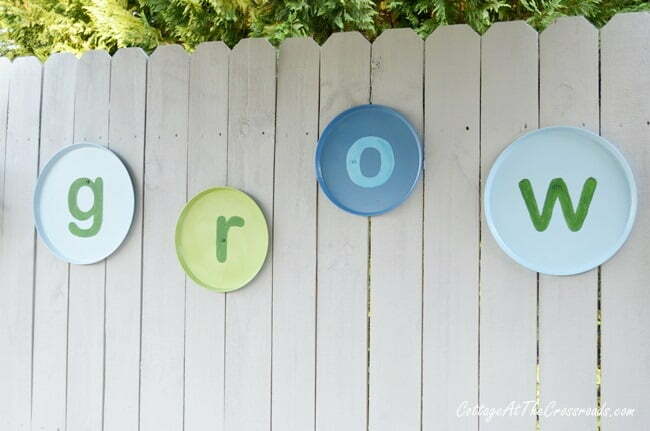 It’s taken me 3 years to get around to sharing how I made these letters that spell out the word GROW. The photo above was taken this morning and as you can see, the letters are still hanging on the wooden fence and look almost as good as new. Gotta love a project that is thrifty and long lasting! The letters are attached to the wooden fence panels that we put in a corner of our garden a few years ago. 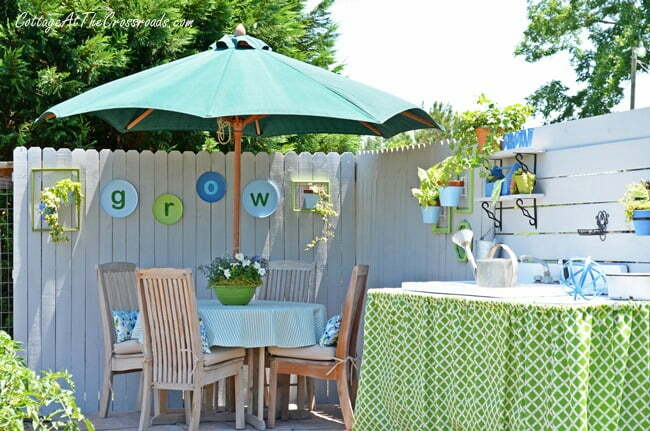 Originally, the DIY garden GROW letters were part of this Outdoor Dining Area in Our Garden. Things were a little cramped in this corner so we built a freestanding deck in the garden and moved the outdoor table and chairs to it. The letters remained on the wooden fence but other changes were gradually made to this corner. Wanna know what I used to make the letters? 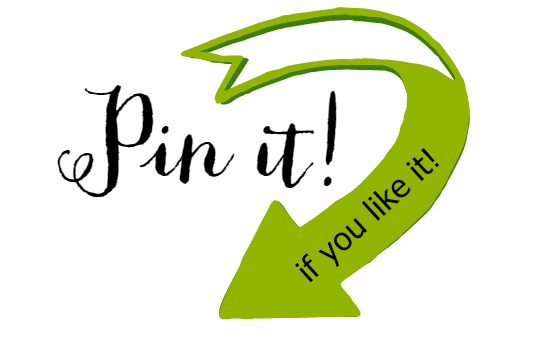 Did you guess metal burner covers? I purchased these at a local discount store but you can find them just about anywhere. All I did was to spray paint them in several shades of blue and green. No primer or sealer was used on them. To create the letters, I just found a font that I liked, printed the letters on paper, cut them out, and traced around the edges. Then I painted them with acrylic craft paint. Leo screwed them into the wooden fence panels and that was it! An easy way to create a garden sign for very little money! I am so surprised that colors have not faded very much, especially since I didn’t use any sealer. Well, perhaps they are a bit softer, which I like. I do spot a bit of rust on one but hey, that’s patina! 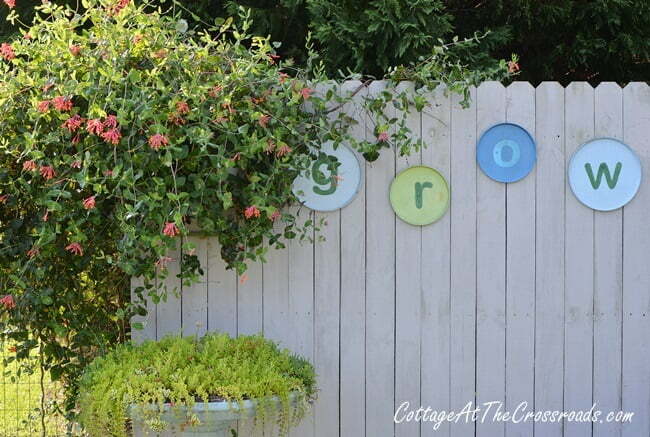 In the 3 years that the DIY Garden GROW letters have been hanging, there have several changes here. One year I created a Succulent Planter out of an Old Bird Bath. 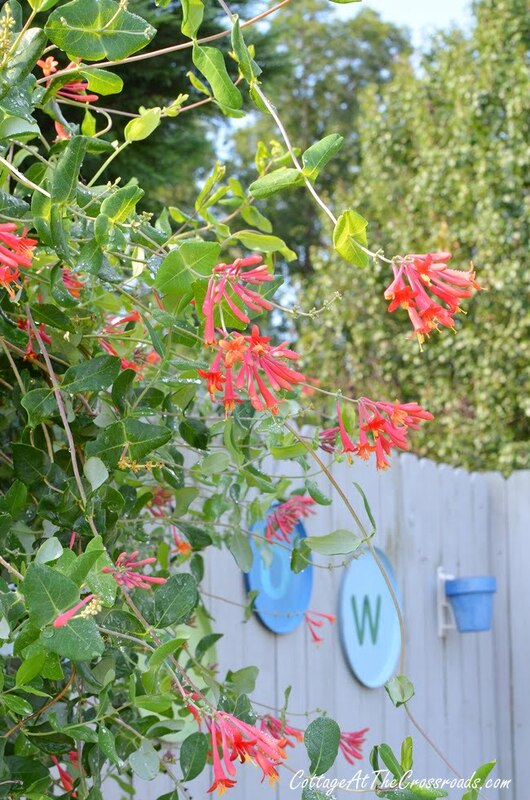 A Major Wheeler honeysuckle vine was planted beside one of the wooden panels. Often I stop my work in the garden just to watch the hummingbirds that visit it. 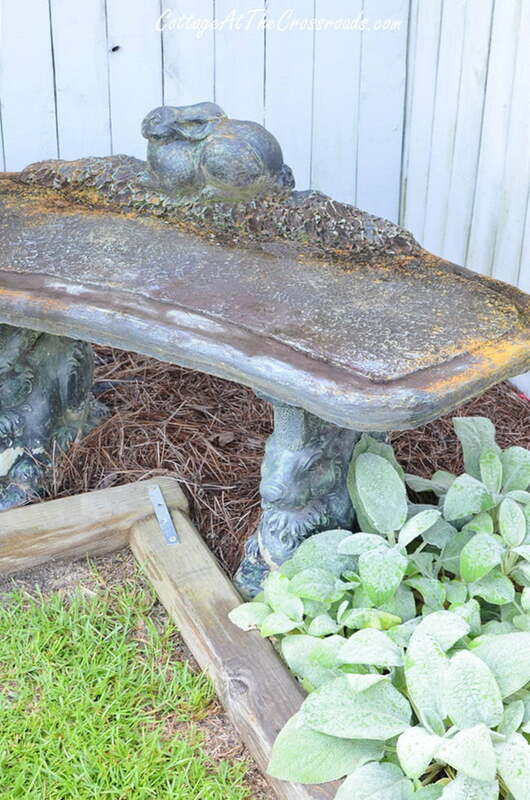 I don’t think I’ve ever shown you this concrete bunny bench that we found at the auction. It provides a nice spot to sit. I planted lamb’s ears beside it which is a perennial. Its velvety texture reminds me of bunny fur! 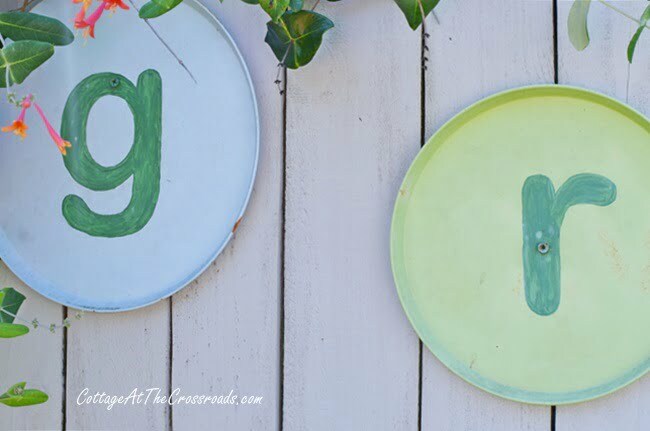 Still loving these thrifty DIY Garden GROW letters that are hanging out in our vegetable garden! Since I’ve revisited this project, I’m thinking that you could paint pumpkins on burner covers for fall and perhaps gingerbread faces for Christmas. 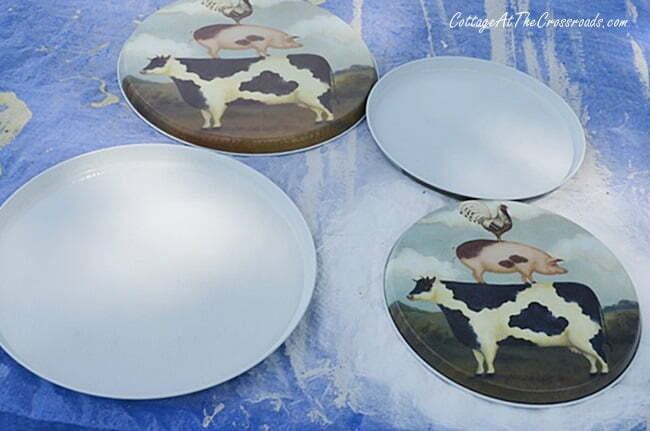 Can’t help thinking of all the possible thrifty things that you could make with them. Speaking of thrifty, check out this month’s projects from the other members of the Thrifty Style Team below. 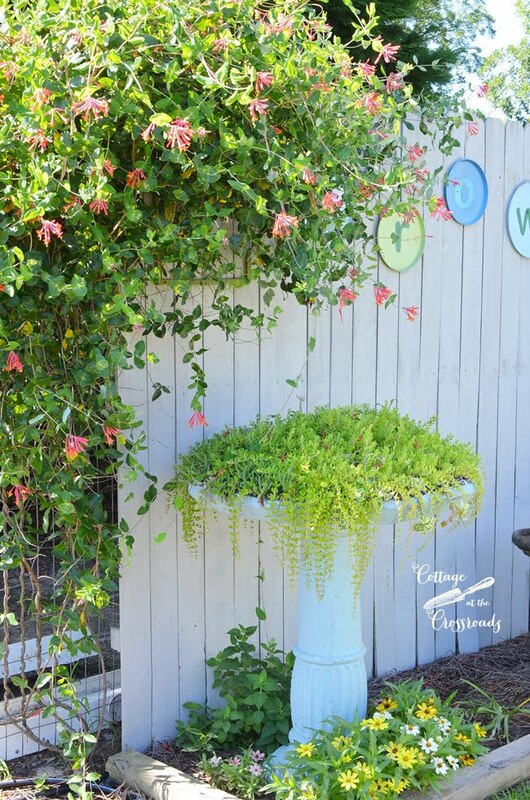 « Enamelware Chair Fountain and a Giveaway! Oh my goodness, these are awesome! You are sooooo smart! I did not guess metal burner covers. That is such a cute idea, even if you did hold out on us for 3 years!!! These are just the cutest. Your garden is so beautiful and welcoming. This was so creative. Love it! 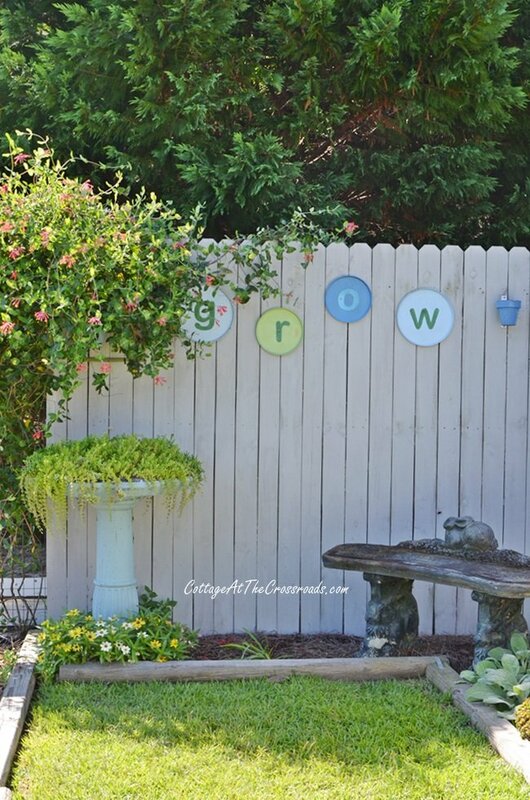 Such a clever idea and your garden is very pretty! Oh my goodness! I never would have guessed these were burner covers. Your creativity goes on and on. 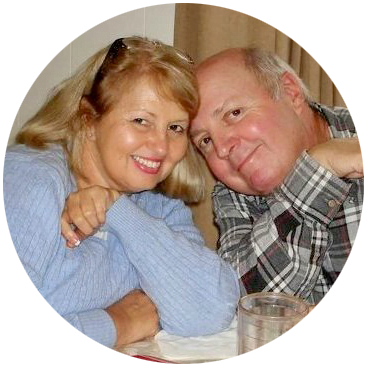 I love visiting your blog and seeing what you are up to. Thanks for, once again inspiring me to go thrifting. I think your garden is doing exactly what you told it to do, Jane! GROW! It all looks so pretty. I wish I had a fence! Love this Jane, so creative! Such a pretty touch in your beautiful garden. Those are too cute for words. I had no clue they were burner covers…that is just so clever! What a great addition to the garden. Ohhhh, you’re clever AND thrifty! Your corner looks wonderful and inviting. I am sending you to sit in the corner right now! I like this! This will add that little ‘something’ in my garden! Thanks! You are a creative genius! 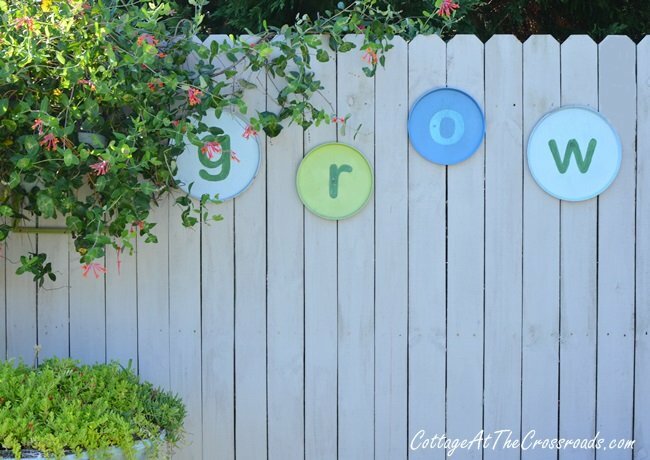 We never would have guessed that your adorable “grow” sign started out as humble stove burner covers. Guess what we will now be on the hunt for on our thrifting trips? Great idea!